jim777, peromucho7, mike570 and 7 others like this. Good for him! I wish some football had been played too. I saw that! Pretty cool! Ah cool, was wondering if that was the one you sold him or a 30th. Came here for this. No idea why he pulled it out for 5 seconds right at the end, but knew you guys would appreciate it. For real Rich? Thats amazing. I saw that! I couldn't tell what exact model though, I thought it was an rfr 550... Looked like he started out with a beat up strat with a Floyd. Good on ya, Rich! I thought of you the minute I saw it! haha! Good to see Ibanez in general get some mainstream love too at the international TV level. The facebook JEM groups are going ape**** over this, which I find hilarious. Vai can beat the hell out of his guitars but someone in a pop band lays one down on the stage and gets demonized for it! Too funny. I remember this guitar very well. I almost bought it from you Rich, but decided not to. Very cool! I had sold that SK, the neck wasn't the best, fairly heavy scrafjointitis which I had warned the buyer, I did the cut and 2-4 were just way too short. It needed the frets pulled and the board planed, refret, clear, finish. We just cancelled the sale as I have no time to be doing 12 hours neck jobs. I sold it to Levine to go thru LACS to do the work, you'll notice the brown spots on the fretboard are gone. They could have possibly built a new neck for it but he was adamant about having an original. 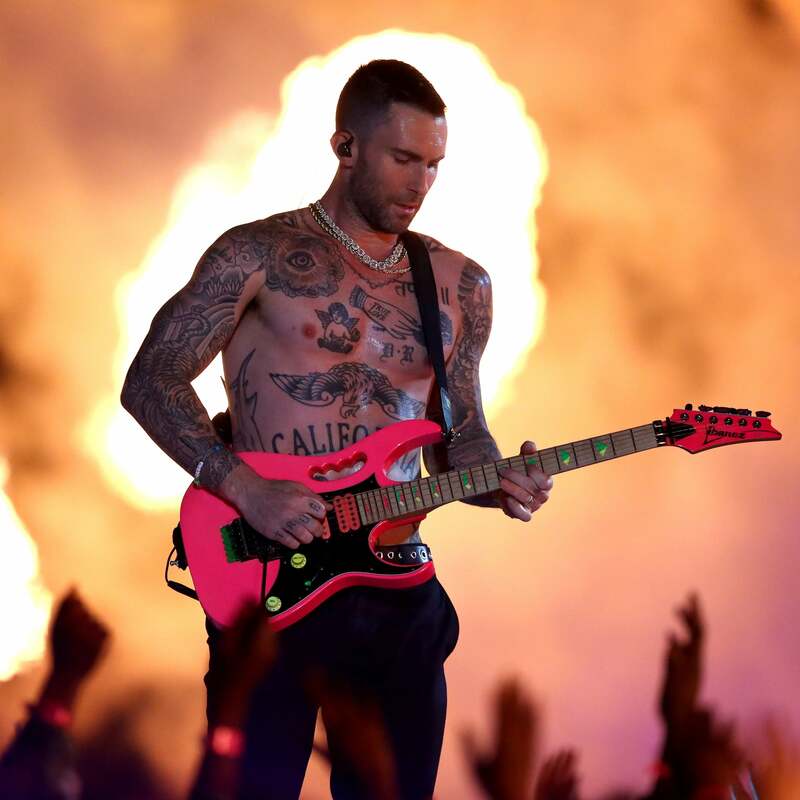 If you google "maroon 5 super bowl" almost every picture is with that SK, it was the most interesting guitar he played! And my boy in Bensalem sent this to me today, I'd never seen him play it. The LNG went out perfect, ready to go on any stage. He didn't keep it long though, he took it onto The Voice set and the house guitar player came up to him gushing about how much he loved it and always wanted one and Adam said "here, it's yours". He really only wanted the SK. It is interesting to see which guitars a guitarist plays who does not have an endorsement and does not need one. Those people are really rare these days, at least in the public eye. jim777, mike570 and mlusiak like this. Absolutely. I often noted this - I'm not into Maroon 5's music. Some of it is okay. But I think it's cooler than all get out that Adam seems to genuinely love these guitars. IT's very, very difficult IMHO to find a guitar that's as easy to play as a well setup Jem. I generally put Bartolini pickups in mine, but that's because I prefer their sound. But the playability of the guitar, those amazing necks, they're just very tough to beat or even equal. jono, Formerly Given To Fly and Hoseki like this. I completely agree here, and I think that's why I've stuck with the guitar as "my" guitar for the past 25 years. I've tried everything from that comes along, whether it's a guitar handbuilt in London, elsewhere in the UK or one of the US custom shops, but at the end of the day, I'm looking for a guitar that is more JEM than a JEM. And there isn't one. It's great to see that someone famous to the "general public" rather than to 80s rock guys is out there playing a JEM on international TV. 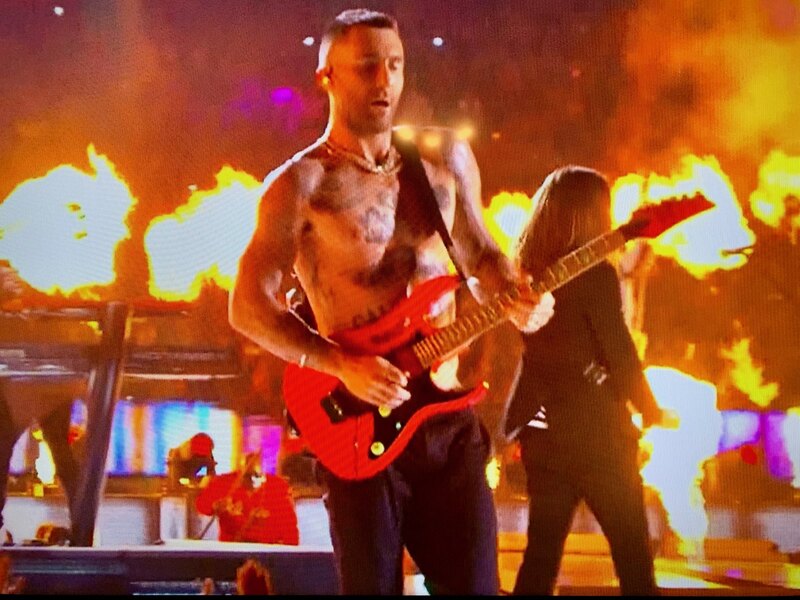 I believe Levine also owns a PMC! jim777, Formerly Given To Fly and Hoseki like this.